This release proves that Motörhead are not slowing down. 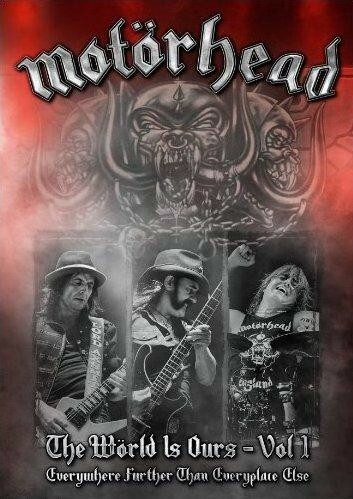 With Motorhead you know exactly what you’re going to get; some people love ‘em for it, others don’t. Either way, you can’t dispute the longevity and consistency of this band. Celebrating 35 years of the loudest music on earth, this DVD/CD package is further evidence that the current line-up of the band is indeed, the best. The DVD features the band’s full performance in Chile at the Teatro Caupolican on April 9, 2011. Artfully filmed by the Canadian guys (Sam Dunn and his company Bangor Films) that made the revered Rush and Iron Maiden documentaries, Motorhead rip through a 17 song set list beginning with the excellent ‘We Are Motorhead’ and like most fans I’m glad they’ve brought that one back. However, headbangers may grumble that the show is in black and white from start to finish. Motorhead have been criticized in recent years for their lack of imagination in terms of their set lists and most of the songs in this set list have been heard a million times before, but the new stuff like ‘Rock Out’ holds up really well. ‘Over The Top’ and ‘I Got Mine’ are highlights of the show for this particular reviewer. But seriously, you’d think Lemmy would get bored of playing the same songs on every tour. There’s such an extensive back catalogue to choose from and yet for the most part fans are always hearing the same stuff. The DVD also contains footage from shows at New York’s Best Buy Theatre and the Manchester Apollo, which are thankfully in full colour. Meanwhile, the CD features selected live tracks. The sound is excellent on both the DVD and CD, mixed by the band’s long-term producer Cameron Webb. There are various packages and even the standard one is a little pricey although you could probably pick up a cheaper copy somewhere online. Motorhead are the kings of the underground metal scene and this release proves they’re not slowing down.